Have you walked down a toy aisle or through a toy store lately? Most kid’s toys these days make some sort of sound or require batteries. I do not remember many toys when I was a kid that I owned that did this. Toys with sounds and actions are exciting for children, but also take away from their creativity. Children are forced to use their imagination and create their own actions and sounds when the toys do not do it for them. Young children love engaging in imaginative play. It is important for children to use these toys because they are being creative and expressing themselves the way they know how. Typically, when engaging in this type of play, children will ask what this object is used for or what a particular object is. Letting a child know that the object can be anything they want it to be helps them be creative while engaging in imaginative play. 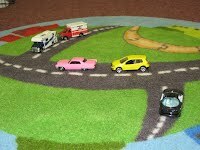 It is also important for children participating in pretend play to know what the real world use of the object is. In pretend play, many children will also imitate what they have seen in the real world. Some examples of toys that will increase creativity in children are; blocks, puppets, play kitchens, toy telephones, dolls, trains, and cars. You do not have to get rid of all your noisy toys, but try something without noise next time you visit the toy store…it may preserve your sanity too! This entry was posted in Uncategorized and tagged Child, Creativity, Imagination, Toy, Toys and Games on March 14, 2011 by katieovercash.